Travelling with children can be stressful. Apart from having to keep them entertained for hours, you often need eyes in the back of your head. For parents, it can be a nightmare. 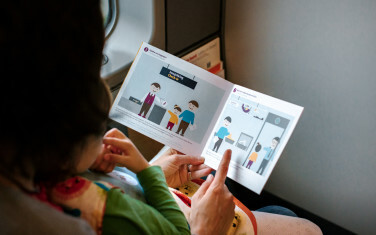 Together with Oslo Airport (OSL), EGGS has helped design Felix & Fiona - a service branding that makes everything as easy as possible for families using the airport. Felix & Fiona is a service branding that provides child-friendly services and facilities for parents travelling with children. The aim is to create an enjoyable experience for them. Everything is presented as a common visual identity throughout the airport, establishing a whole Felix & Fiona world that’s easily recognisable - from children’s play areas, and the popular climbing frames shaped like airplanes, to maternity corners, nursing rooms, games, puzzles, children’s menus, security, etc. 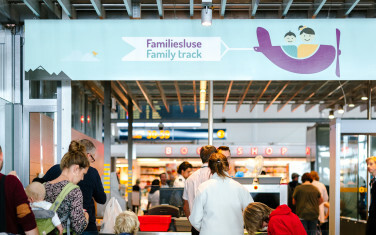 The family track at Oslo Airport was the first of its kind in Norway. With footprints on the floor, along with colours and shapes that show children the way, it’s easy to locate. Before travelling, parents can go online to get advice. They can also download helpful Felix & Fiona comic strips, illustrating the various airport procedures they’ll face as part of their journey. Security control for example can not only be intimidating for children, it can be stressful for parents too. Therefore, the family track was introduced. This is a designated security lane for parents travelling with children, allowing them to pass through security control with a minimum of fuss. Illustrated comic strips are available online, so that children are better prepared for the trip ahead. Knowing what to expect helps reduce stress for both children and parents using Oslo Airport. EGGS has helped design the branding concept and visual communication for Felix & Fiona. The whole thing is simplistic, playful and incorporates vivid colours to help make all information, services and facilities easier for children and parents to recognise and access. Also, what the Felix & Fiona branding manages to achieve in an innovative way, is it successfully integrates paid commercial services with free airport facilities. As a result, it’s available to any contractor at Oslo Airport wishing to adopt more family oriented services. Plus, it provides a lot of scope for Felix & Fiona to be applied to any new services or facilities in the future. Since Felix & Fiona was implemented, the effects have been overwhelmingly positive. For example, according to a recent customer survey, 84% of families using the family track were happy with the service, whilst 95% of all travellers using the airport in general were also in favour of the family track. This indicates that it's a valuable addition not only for families but for other travellers, who experience reduced queues too. Because of the success of Felix & Fiona throughout Oslo Airport, Norwegian civil airport operator Avinor has now applied the concept to several other major Norwegian airports. So, for parents travelling with children, using these airports services and facilities is bound to feel like child’s play from now on!